DCPL is most trusted manufacturer and exporter of Liquid oxygen production plant in India. Cryogenic Liquid Oxygen Plant designed and developed at our manufacturing units in India to generate highly pure liquid oxygen. Available in different capacities ranging from 20 Litre/hr. to 1000 liter/hr, the systems ensure smooth performance and durability. Once installed, they perform for years without wear and tear. The purity of liquid oxygen is upto 99.7%, which is perfect for different medical and industrial applications.We have a number of well educated and experienced professionals to perform each task with perfection. Manufacturing process is also supervised by quality controllers in order to ensure smooth performance of the devices. If you want technical details and quotations, you are advised to get in touch with customer care executives. Our company has been flourishing in the industry for manufacturing and supplying Cryogenic Liquid Oxygen Plant. 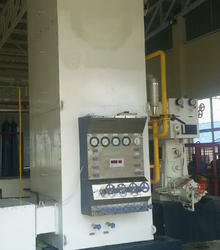 The machines are technologically advanced and fully automatic so perform as per the plants of international standards. With the purity up to 99.7% oxygen and 99.99% nitrogen, the systems come up with capacities ranging from 20 m3/hr to 5000 m3/hr. They can be tailored as per the requirement of the customers. Our Liquid Oxygen Plant are designed and developed to generate liquid oxygen and nitrogen with high purity, which is upto 99.7% and 99.99% respectively. The manufacturer is manufacturing, developing and supplying a wide range of liquid oxygen plants of different capacities ranging from 50 m³/hr (70 liter/hour) to 500 m3/hr (700 liters/hour). Users will receive Liquid oxygen with purity up to 99.7% and nitrogen from 99.6% to 99.999%. Apart from safe, effective easy to operate, the machines come up with ready to install components. The technology employed in our machines is acquired from the international market to make the systems high performing and durable. Our systems are popular in the industry for having a number of features such as functionality, reliability and durability. STEP 1 - Air Compression: Atmospheric air is compressed at a low pressure of 5-7 bar (Gas plants) by our trouble free rotary compressor (Screw / Centrifugal Type advanced technology is employed in lieu of old bulky piston reciprocating compressor). STEP 2 - Air Pre-Cooling: The second stage of the process uses a low pressure refrigerant (R-407A as per CE regulations) for pre-cooling the processed air to temperature around 12 deg c before it enters the purifier. STEP 3– Purification: The air enters a purifier consisting of twin Molecular Sieve driers working alternatively. The Molecular Sieves eradicate the CO2 moisture from the process air before the air enters Air Separation Unit. STEP 4 - Separation of Oxygen and Nitrogen at Air Separation Column: Oil free, moisture free and CO2 air enters into low pressure plate fin type Heat exchanger where the air is cooled below sub zero temperatures by air expansion process. Due to the excellent thermal efficiency, we can achieve a temperature difference delta t as low as 2 deg c at the warm end of these exchangers. STEP 5 – storage for Gas: The final product in the form compressed Oxygen/Nitrogen goes to the high pressure oxygen cylinders at 150 bar or upto higher UPTO 200 BAR as required, or for pipeline supply or captive consumption. Looking for Liquid Oxygen Plants ?